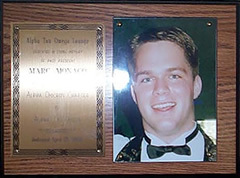 The Alpha Tau Omega Brotherhood was such an important part of Mark's life since the time that he pledged as a sophomore in 1993. He was proud of his fraternity and always invited his family to spend 'event' weekends at SLU. Parent's weekend, the Rasta Pasta festival and the Annual Fall Homecoming weekend always ended up being a barrel of fun as Mark's ATO Brothers, family members, SLU classmates and childhood friends met at the Alpha Omicron House to let loose. ATO's Father/Son Weekend, which Mark initiated in his junior year, saw the ATO Dad's travel from all over to spend a weekend on campus with their sons. As a resident or visitor to the house, you immediately became comfortable in the ATO Lounge where you could socialize, play pool, watch the tube, have a snack or funnel a beer. Mark enjoyed the time that he spent in the lounge: laughing, learning about his brothers and classmates, sharing his dreams or working with people to achieve a common goal. To bind men together in a brotherhood based upon eternal and immutable principles, with a bond as strong as right itself and as lasting as humanity; to know no North, no South, no East, no West, but to know man as man, to teach that true men the world over should stand together and contend for supremacy of good over evil; to teach, not politics, but morals; to foster, not partisanship, but the recognition of true merit wherever found; to have no narrower limits within which to work together for the elevation of man than the outlines of the world: these were the thoughts and hopes uppermost in the minds of the founders of the Alpha Tau Omega Fraternity.